Over the past few years I’ve seen an increase in articles and posts about whether or not to do estimation (of cost, schedule and effort) for software development projects. This is especially true when agile/iterative methods are used to develop software for which requirements are not readily known in advance. There are actual “movements” set up to prove that estimating in and of itself is bad for software development. At the same time, I’ve worked done more and more work for clients related to software benchmarking (to find best-in-class methods, tools, and combinations to develop software) and estimation (including price-to-win estimating.) I’m now convinced that “To estimate or not to estimate?” is simply the wrong question – or at least a premature question for many companies. This does not include those organizations where the mere notion of projects (being a temporary endeavor intended to deliver an identified product, outcome, or service such as a piece of software) is like a foreign language. When I teach courses according to the Project Management Institute’s Project Management Body of Knowledge (PMBOK(R)), it’s not uncommon to find IT pros who profess that project management is not needed because their work is bounded solely by calendar months and the number of full-time-staffers. The idea that work should be managed towards a specified outcome (with goals, objectives, timelines, milestones, deliverables and a formal end) just doesn’t fit into their paradigm, even for those involved in developing advanced technology solutions. I’m excluding these companies because projects (and estimating cost and schedule) are actually beyond their comprehension, as is productivity, project comparisons or process improvement. If we do an estimate, do we know what are the correct input variables (and values) we should use? (i.e., Some idea of scope, non-functional requirements, constraints, goals, project environment, etc.) Garbage in equals garbage out. When estimating, do we have access to correct and appropriate historical data on which to rely? (i.e., does the historical completed project information accurately depict what actually happened on the project? Often up to 40% of true project work effort is not recorded – or it is recorded inconsistently.) Incomplete or incorrect historical data make for poor comparisons, and even worse estimates. Are the estimating models we propose, appropriate for the industry and application? (i.e., in construction, it would be folly to use a home building model for a hospital construction or bridge construction project, so too with software.) Every model, no matter how advanced, needs to be calibrated for the organization using it. These are just a few of the important questions that need to be addressed – before we attempt to estimate and rely on the results of the practice. When estimating is done without proper planning, discipline and consistency, the results will be unreliable and even worse, downright wrong. What other questions are critical to ask? What do YOU think? What’s the Point of Estimating? “What’s the Point of (Early) Estimating?” … click on the image or the title here to read the full blog post. Enjoy! Comments are always appreciated and welcome. What do you think of this post? 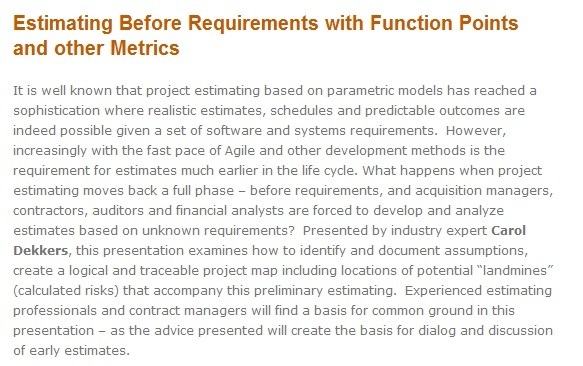 On June 7, 2012, I conducted an hour-long webinar on “Estimating Before Requirements with Function Points and Other Metrics” before a worldwide audience spanning a myriad of software development specialties/industries and across many countries. At the end of the webinar, I offered to send attendees several papers (also downloadable from this link) as well as a Scope Management primer. If you are interested, please send an email to me at: dekkers (at) qualityplustech (dot) com. Let me know what you think of the concepts and the webinar!